A new observation of the galaxy cluster Abell 160 is giving astronomers important insight into the motion of galaxies as they plough through tenuous gas in space at supersonic speeds. Observations made with the Chandra X-ray Observatory reveal the wakes they create behind them. These wakes, or tails, are a unique source of information about the movements of galaxies in clusters, which is helping astronomers understand how the structures of galaxies in the universe have been assembled. This is the first time that the wakes of many galaxies in one cluster have been observed. The results, obtained by an international team of astronomers from the UK and the US, were presented by doctoral student David Acreman of the University of Birmingham (UK) at the UK/Ireland National Astronomy Meeting in Dublin. Most galaxies congregate together in clusters containing anything from several galaxies to a few thousand. Clusters are pervaded by a large cloud of hot gas, which is held in place by the gravitational attraction of the cluster as a whole. The galaxies move through this gas at high speeds (up to a few thousand kilometres per second). 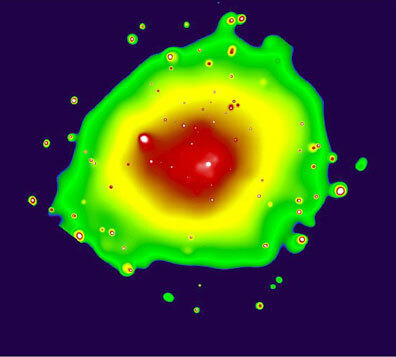 The resulting ram pressure strips and distorts the gas clouds associated with the galaxies themselves. When the galaxy is moving supersonically, this is accompanied by a supersonic shock wave like that around a supersonic aircraft. The superb imaging capabilities of the Chandra X-ray observatory enabled unprecedented observations of these shocks and stripping processes which are visible due to the X-rays they emit. Gas stripped from a galaxy can form a tail that is visible in X-ray observations. The direction in which the tail points indicates the galaxy's path across the sky. "This information is vital for understanding the way in which galaxy clusters formed, and we can't get it any other way," said David Acreman. "Abell 160 was an ideal cluster for this kind of study," he says, "because it has not been disrupted by a recent merger with another cluster. It also has the advantage that several bright galaxies are located near its centre where Chandra can view them with a single observation. Our observation encompasses 29 of the galaxies in Abell 160 and we find that 19 of them appear to be moving on roughly circular orbits while 10 seem to be moving on more radial paths." "Galaxy clusters are thought to grow as galaxies are pulled onto them by the cluster's gravitational attraction; this would lead to a preponderance of radial motions," David Acreman explained. "The preference for circular orbits in Abell 160 suggests we are observing a cluster that has remained undisturbed for some time allowing the galaxy orbits to become more circular as the dynamics of the cluster settle down."